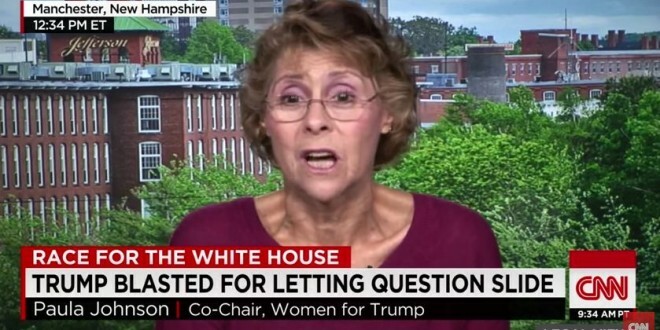 Crazy Lady Talks Trump On CNN [VIDEO] - Joe.My.God. Neither host Ashleigh Banfield nor Johnson’s fellow guest Dean Obeidallah were able to contain the magnificence that was this former alderman and state representative’s tenacious personality. The subject was Donald Trump‘s Thursday night rally, during which a Q&A session immediately became an anti-Muslim slug-fest directed at President Obama. Obviously, Obama isn’t a Muslim, but this has never prevented his detractors from accusing him of such. And when the accusation was leveled at Trump’s rally, the GOP presidential front-runner didn’t deny it. Many have criticized Trump’s handling of the situation. Democratic presidential candidate Bernie Sanders called it a “disgrace” and fellow Republican Chris Christie insisted Trump should have corrected the accuser. Yet when Banfield brought the matter to Johnson and Obeidallah’s attention, the former responded beautifully. “A lot of people ask questions of Mr. Trump, and since we don’t have censorship, people ask anything,” she said, adding that the particular question about Obama being a Muslim was “awkward” and “wrong,” and it “bedazzled” her. She said the word bedazzled. Johnson immediately went on the offensive, accusing Banfield (and, by extension, the media) of being “upset” with Trump no matter what he does or does not say. Eventually producers had to lower the volume on Johnson’s microphone when the hosts were unable to interrupt her long enough to make a graceful exit.